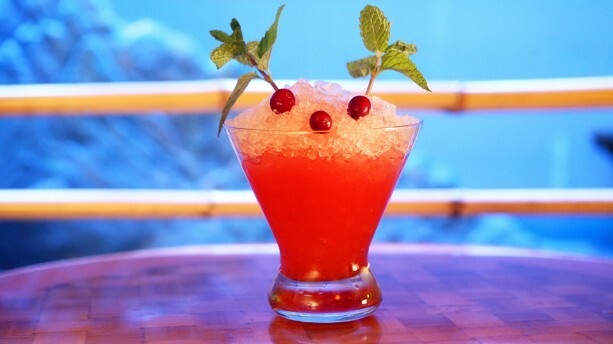 One of our FAVORITE places to hang-out in Disneyland — Trader Sam’s Enchanted Tiki Bar — is serving seasonal beverages for the Christmas season until January 5, 2014. Trader Sam’s at the Disneyland Hotel is an imagineering marvel (thank you Kevin and Jody! ); plus, the menu highlighting South Seas flavors is delicious! When you’re ready to hide away from the holiday crowds, the new Red-Nosed Zebra (a chilly concoction of aged rum, strawberry puree, lemon, and lime juices) is the perfect cocktail for $9.50. This sounds like the perfect sweet/tart treat. Sign me up! Or warm your spirit while sipping the Gorilla Nog ($10.75) with honey-flavored whiskey, Sam’s Gorilla Grog, ginger, and orange liqueurs. Spicy!! 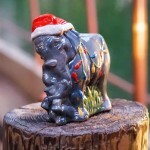 A wintry delight! 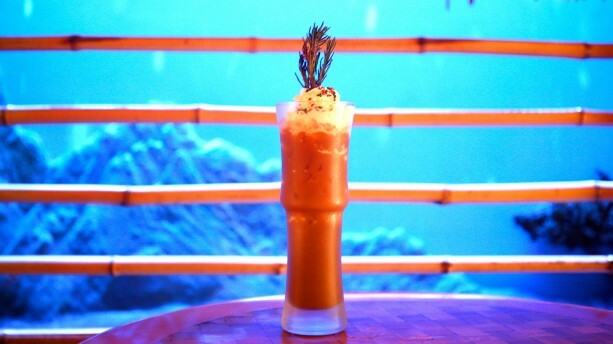 The Mele Kaliki-Mocha (with a combination oficed coffee, cream of coconut, and coffee liqueur) is beautifully topped with whipped cream and offered for $10.75. Stop by with the whole family before 8PM and check out Sam’s No-Booze Brews for those on the designated driver list. After 8PM, Trader Sam’s Enchanted Tiki Bar is restricted to the 21 and over crowd. 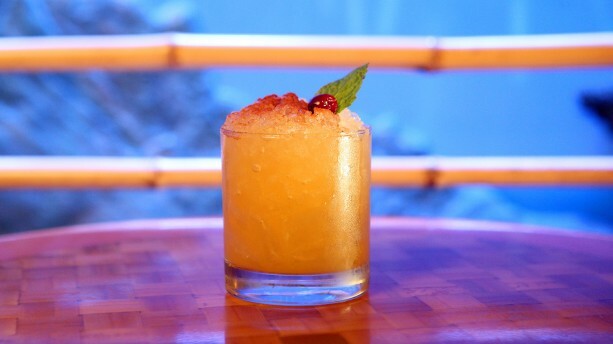 What’s your go-to beverage at Trader Sam’s? Which specialty drink would you enjoy sipping this holiday season? Share — in the comments below, please! « News! And Review: Animal Kingdom’s Tamu Tamu Refreshments New Menu! Although I’m just fine with non-alcoholic bevies, I’d def pick the ‘Red Nosed Zebra’. It looks so cute and sounds delish (as long as I wasn’t driving)! 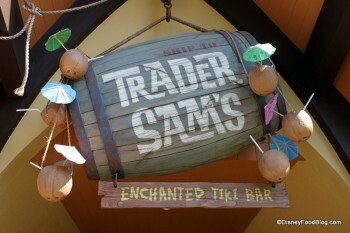 I would really love a Trader Sam’s at WDW! Not even for the beverages but I’ve heard the food is great and the atmosphere looks amazing!!! I heard a rumor that Trader Sam’s was coming to the Polynesian. Anyone know if there’s any truth to this? Leslie and Chuck: Still a rumor, but my fingers are crossed! Trader Sam’s really is incredible! 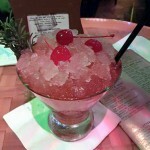 We went to Trader Sam’s in April, and LOVED it!! We ended up getting a few rum drinks that were super strong, we couldn’t finish them. 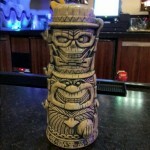 We love all things tiki, so we were thrilled by the ambiance. I would definitely go for the coffee drink-it looks delicious! I’ve been to disneyland a lot and never found my way over here…must try next visit!! !